A room with a chandelier - it's always more elegant and sophisticated than a room without! And your bedroom or baby nursery with a chandelier is no exception! Because of the beauty of chandeliers, chandeliers always stand out and make a huge first impression on people coming into the room. Chandeliers, in all of their glory, make us look up in a room rather than just looking at eye level. Once your eye looks up, it is much more likely to look all around the room rather than just see what is at the eye level. A chandelier is like a piece of beautiful furniture or a fabulous piece of art. Depending on how elaborate it is, it can become the focal point of a room. Regardless of the style and size, a chandelier will make your room look more elegant and sophisticated. 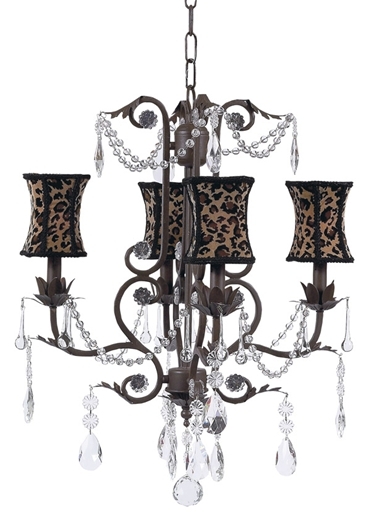 Chandeliers come in a wide array of styles, looks, and sizes. 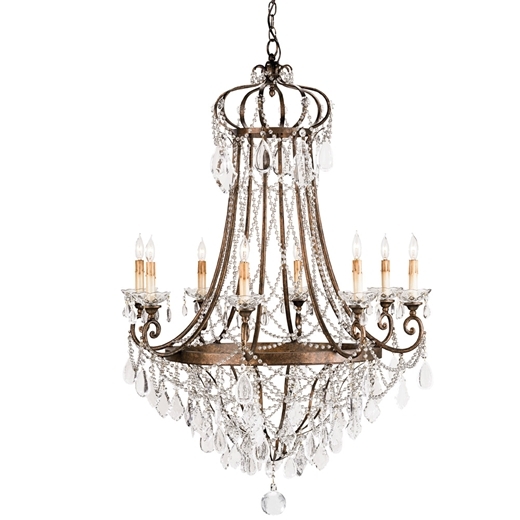 We once thought of chandeliers for use only in a dining room or large front entrance foyer. They are certainly still beautiful and totally appropriate for either of these rooms. However, they are equally beautiful and perhaps even more so in the more uncommon places such as kitchens, bathrooms, and especially bedrooms. The reason for a chandeliers unparalleled beauty in these uncommon spaces is that the installation of a chandelier is somewhat unexpected. Because of this, you are more likely to notice it, step back and say WOW! I, as an Interior Decorator and Designer, have played with chandeliers in almost every room of the house, including the kitchen, bathroom and bedrooms - especially the master bedroom and baby nursery. There have also been many instances of installing a chandelier in girls' (both young and teenage girls) bedrooms - creating a fabulously girly space. With the multitude of chandeliers available today, you are sure to find a chandelier to suit your bedroom or baby nursery - both in a coordinating style and appropriate size. As with many home decorating projects, the lighting is often forgotten and neglected. With a chandelier installed in your bedroom, it most likely means that you have left nothing out and have fully completed the decorating in the room. As a home interior decorator, I love to see that! Install a chandelier in your master bedroom and you will instantly boost the level of elegance and sophistication of the bedroom - regardless of the chandelier style. For a formal master bedroom, I recommend a more ornate, typically feminine chandelier - a crystal chandelier or a metal chandelier with hanging crystals - a chandelier that will make a huge statement in the room. A large intricate chandelier in a master bedroom will help make the room feel more like a royal suite bedroom in a castle. You may even feel like you are entering an expensive and lavish hotel room. There are also chandeliers suitable for less formal master bedrooms. You should choose a less intricate chandelier with cleaner lines. Many of these chandeliers are done in metal and may include simple fabric shades. 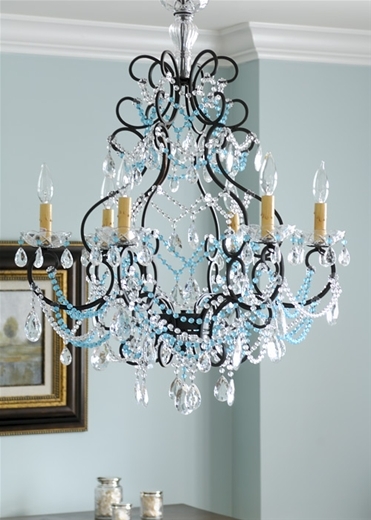 This type of chandelier will still increase the elegance in the room without distracting from the overall style. Today, there are numerous selections of chandeliers perfect for a little girls room or a baby nursery. A shabby chic style chandelier is absolutely perfect. It provides the finishing touch for the ultimate girly, feminine and elegant bedroom decor. A shabby chic chandelier paired with traditional old world floral bedding or some traditional toile crib bedding and soft wall colors	is absolutely perfect. 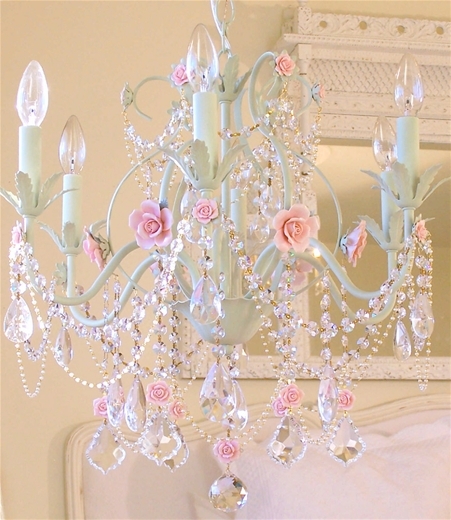 Shabby chic chandeliers are the ultimate in femininity. In saying that and as is probably obvious, most shabby chic chandeliers are not really suitable for most boys bedrooms or nurseries. However, if your baby boy happens to be a 'prince' as opposed to a 'cowboy', then there are options for a shabby chic chandelier for his nursery. You can buy chandeliers, which while still being somewhat feminine, have masculine characteristics which would be suitable for a baby boys nursery bedroom. The chandelier shown here would be not only appropriate but, absolutely adorable in a baby boys nursery. Because it is done in a darker bronzed metal and includes blue beads, it has a more masculine feel while maintaining a soft, elegant and luxurious feel - perfect for the little prince in your life. Pair this chandelier with some traditional bedding fabrics for boys - blue toile, black toile, stripes - and a metal crib and you will create a stunning boys nursery fit for a Prince. As you can now see, chandeliers are not just for dining rooms and foyers anymore. The variety of sizes, shapes and styles of chandeliers available today leaves us no excuse but to consider a chandelier in our own Master bedroom, our child's bedroom or our baby's nursery. Author: Shelly Whitney, Interior Designer and Decorator.